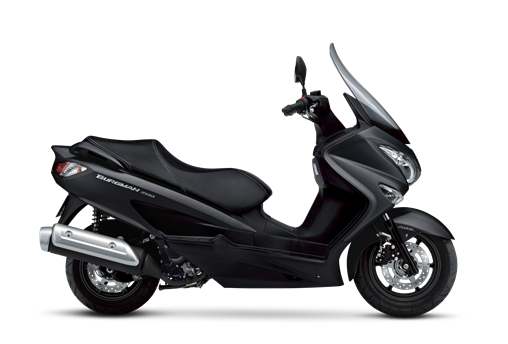 New Metallic Matte Black color combined with sculpted dual tail lights defines Suzuki’s distinctive craftsmanship. Eco Drive indicator educates you on the best way to ride your Burgman for maximum fuel economy. • The Eco Drive indicator does not automatically improve fuel economy but may help riders refine their riding efficiency and improve fuel consumption. Fuel consumption may vary depending on conditions such as the frequency of starts from stop, distance driven, rate of acceleration (throttle use), chosen speed, and maintenance. Amply padded big two-person seat with lumbar support for the rider supplies comfort even on bumpy paved streets.Low, 28.9-inch seat height and cutaway footboards create an ergonomically comfortable riding position that is designed for an easy foot reach to the ground. Spacious under-seat storage can hold two full-face helmets or large cargo bags and extras. Convenient light automatically illuminates the luggage space. • Helmet sizes and shapes vary, so some helmets may not fit in the under-seat compartment.